In the wrong hands, an album of string quartets can be a staid affair. 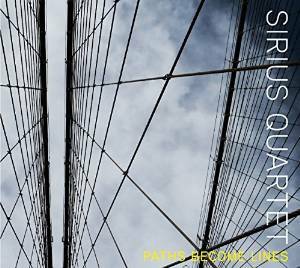 Luckily, the Sirius Quartet has the right hands – eight of them for that matter. Like so many modern classical composers and performers, Sirius is informed and influenced by a wide array of styles – rock, jazz, and middle-eastern, among many others. This is apparently from the first moments of the self-titled opening track, an urgent piece with a decidedly non-classical structure that resembles what one might expect from an ensemble that has collaborated with Elliott Sharp and Doctor Nerve. This is not to say there is no elements of the romantic period sneaking their way in – just that Paths Become Lines is not entrenched in this era. For instance, the fourth track, Spidey Falls, features grinding violins over a rapid tempo, and includes a break with polyrhythmic percussion. The middle portion of the recording is a traditionally-structured, four-movement string quartet (String Quartet No. 4). The first movement slowly builds up tension, then releases it with dissonant chords. Slowing things down as expected, the second movement is more atmospheric and sparse. The third movement includes elegant contrapunctal lines, while the fourth features up-tempo complexities and wonderfully disjointed cadences. Perhaps because it covers so much ground, Paths Become Lines seems all over the map at times, combining the familiar and novel. Nonetheless, this is merely an observation and the eclecticism therein does not detract. This is a strong offering from a new-music outfit that not only promises, but delivers.